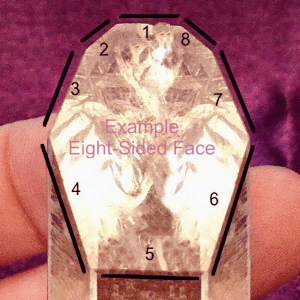 Eight Sided Face crystals are also called Grounding crystals. They have eight edges on the main face. This is a fairly rare occurrence (and there are still only six sides on the body of these crystals). A stop sign also has eight sides; use this to remember that Eight Sided Face or Grounding crystals help you to stop and ground. I like to put my thumb on the Eight Sided Face (Grounding face) which is the largest face and work with it that way. Press and hold the grounding face to ground energy in any chakra. Empathic Arkansas quartz crystal cluster, has all different sizes of points. Two of the bigger points are Eight Sided Face Grounding crystals, each is chipped. 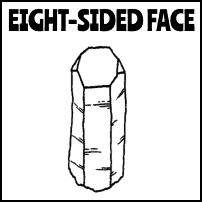 There is at least one intact Eight Sided Face Grounding crystal. Completely natural Arkansas quartz crystal cluster with mineral still attached from the mine, has not seen an acid bath. Very earthy energy with at least two Eight Sided Face Grounding crystals.